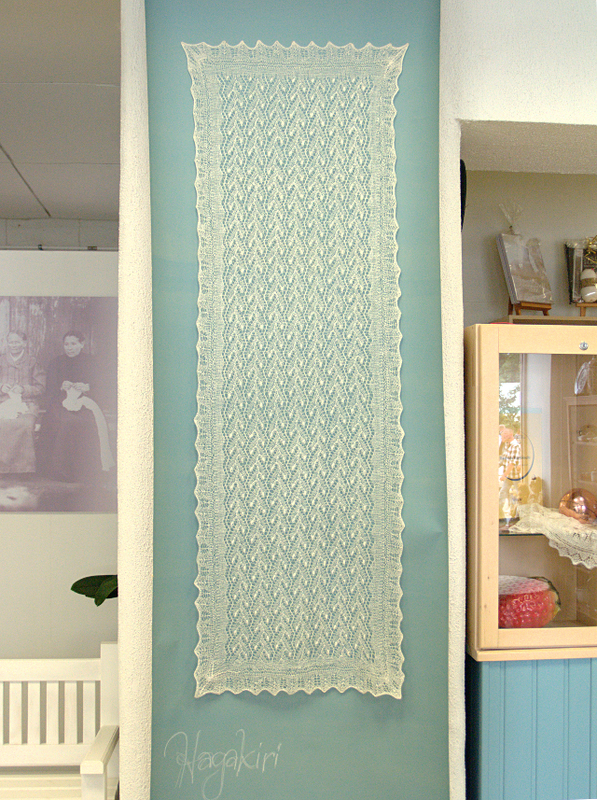 In my last two posts I wrote a bit about the Haapsalu IV Lace Day and showed some pictures of the lace knitting competition and the knitted lace wedding dresses on display in the Haapsalu Lace Center. 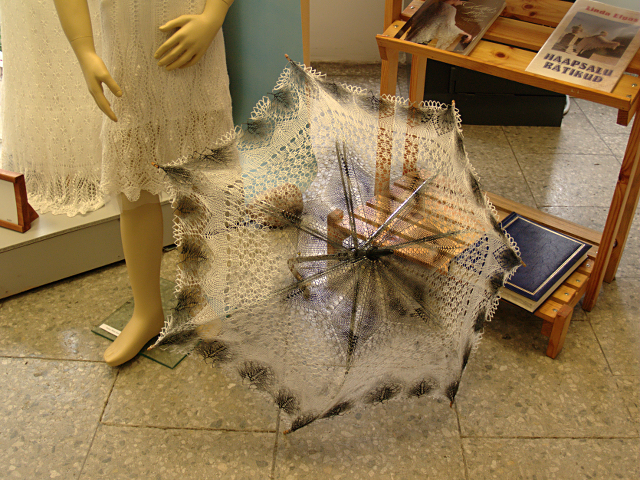 This time I have a couple of pictures more to show from the Haapsalu Lace Center. I am always amazed by the craftsmanship and the ideas that handicraft makers have. If you happen to travel through Haapsalu make sure to visit because there are so many things that I didn’t take pictures of and they also have different exhibitions going on all the time. In the lace center there are some shawls that are knitted and on display, and I do have to say that the blue background suits the shawls perfectly (I may be biased because my favorite color is blue) and they also used a blue background for the entries in the kitting competition. All the shawls also have the name of the pattern included, for example this shawl is knitted with the pattern “Hagakiri”. Displaying the patterns on shawls is a beautiful way to do it, but as there are so many different patterns it would need a huge room where to put all of them so some patterns (and they are really only a fraction of the patterns that exist) are being displayed as swatches. 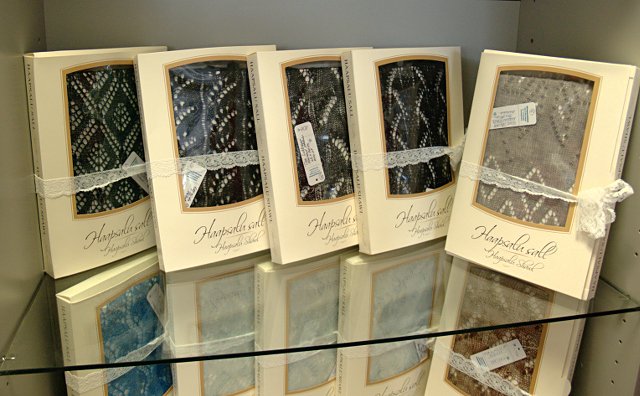 The shawls for sale are packed into beautiful gift boxes and arranged on the shelves by color. Traditionally the shawls were knitted mostly from natural white yarn (occasionally also with black or grey yarn) but now you can find shawls in all colors. They are the perfect gift to give to a mother-in-law or a bride. 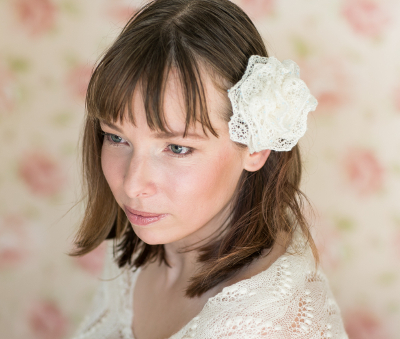 Now this is what I love, we all know about lace parasols but this here is a lace umbrella! 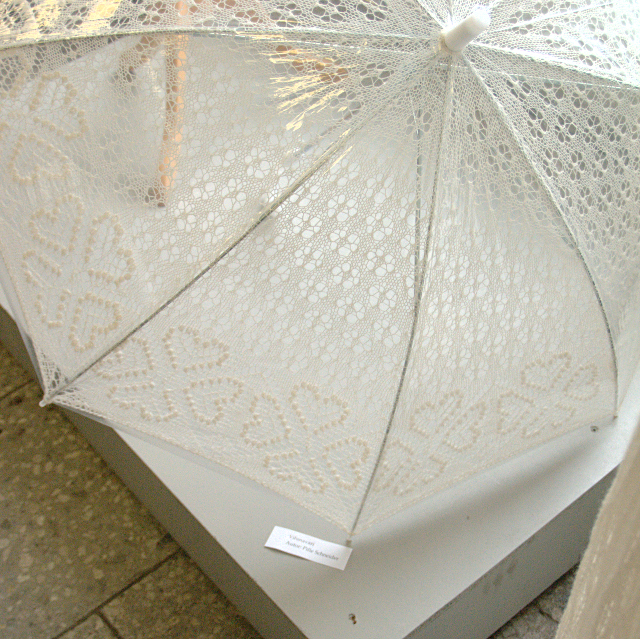 The lace has been put under a clear umbrella and so you can look stylish even in rain as was demonstrated clearly on the Haapsalu IV Lace day when it started raining during the lace demonstration. What a brilliant idea to use in your wedding instead of regular ones that can ruin your wedding pictures. 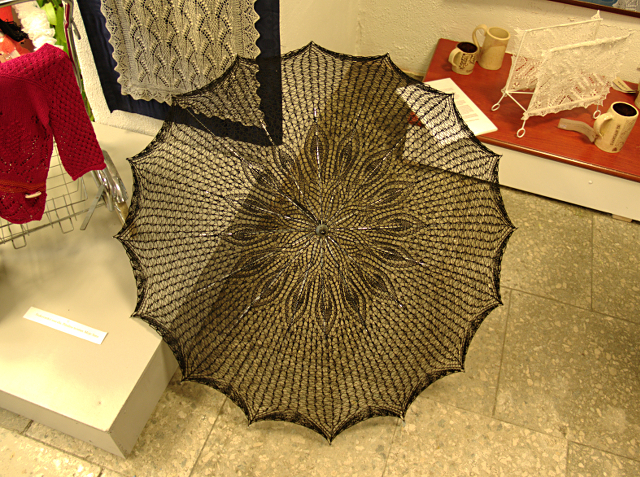 The umbrella is knitted by Pille Schneider. I was really intrigued by this parasols color, what do you think was the yarn colored like that or was the parasol colored after it was knitted? 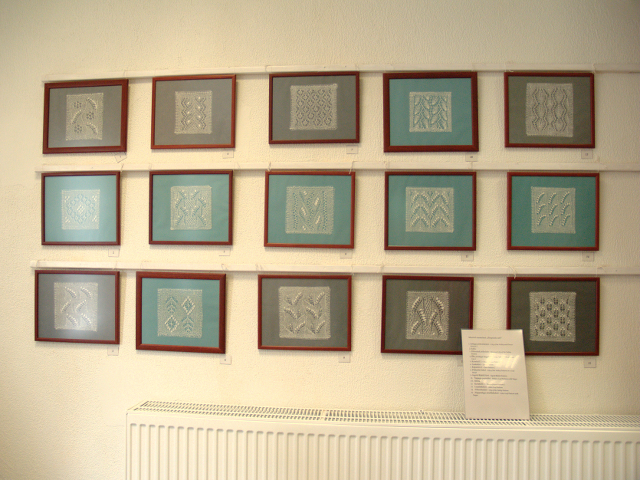 The patterns of Haapsalu Lace can be used in so many places. 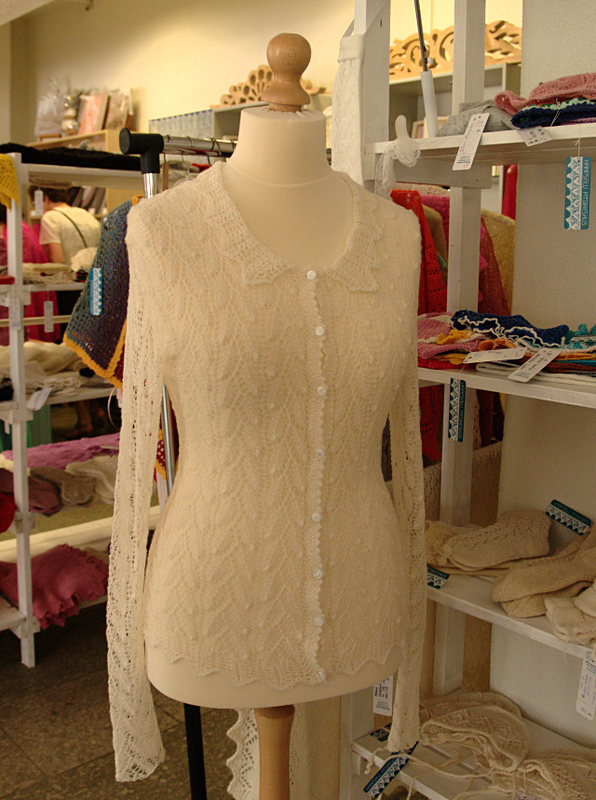 Here is a beautiful lace cardigan and on the shelf to the right of it you can see socks and hats and all sorts of other things inspired by the patterns. And lastly something I know my girls would love – lacy clothes for dolls. 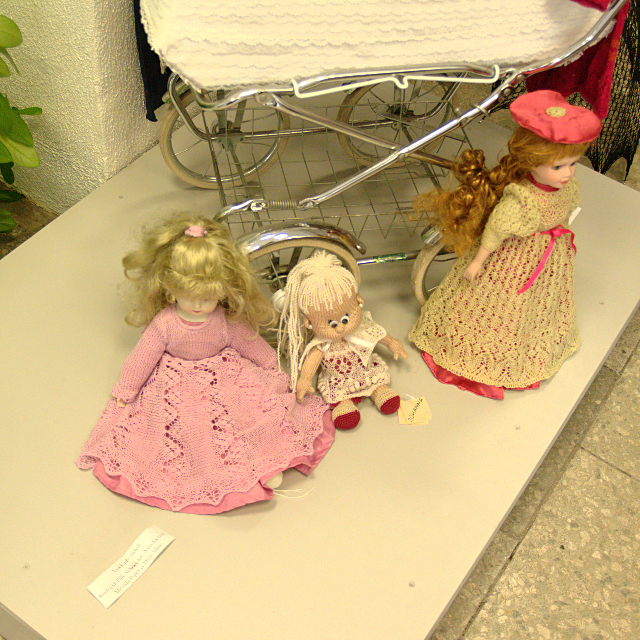 They are knitted by Pille Schneider, Aasa Jõelaid, Miralda Piper and Mirje Sims. This week I have thought a lot about the coming spring and the time when the apple trees and cherry trees start to blossom. How the sweet wind rustles in the small leaves and birds sing… Ok back to today, many of my own hand-knitted items remind me of this time, like small pink hair flowers and when I looked around Etsy today I also seemed to see only pink items. Inspired by the colors of spring blossoms – cherry and apple tree blossoms.Enjoy! 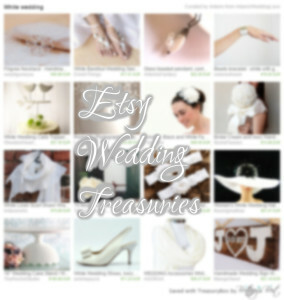 Today I looked around Etsy a bit more than usual and I was so inspired by the things ohter people make that I compiled my first treasury in Etsy.